The gig economy — the increasingly popular employment model where people work as independent contractors rather than employees of companies — has a destabilizing effect on personal financial security, a Prudential Financial, Inc. (NYSE: PRU) survey shows. Gig Workers in America: Profiles, Mindsets and Financial Wellness, released today, reveals that the majority of respondents who work solely as temporary or contract workers don't have access to employer-sponsored retirement or insurance plans, and report making only 58 percent as much as those who hold traditional full-time jobs, on average. The gig economy model is being adopted by both emerging companies and established firms to outsource some non-core functions. It may result in unintended economic consequences, as people turn to contract work without the protections of key benefits such as employer-sponsored savings and insurance plans. Gig workers made up 16 percent of the U.S. workforce in 2015, up from 10 percent in 2005, according to a study by economists Lawrence Katz and Alan Krueger. "While the gig model is cost-efficient for employers, reduces their benefits costs and gives workers flexibility, these workers may in turn suffer from income volatility and lack of access to a benefits safety net," said Andy Sullivan, president of Group Insurance, Prudential. "The money made by gig work may contribute to reducing the national income gap, but the decline in employer-sponsored savings and insurance plans is doing little to address the wealth gap. Without benefit protections, many gig workers are left financially vulnerable." Several themes emerged regarding three categories of workers: gig only, people who did contract work exclusively; gig plus, individuals who did contract work and held a traditional full- or part-time job; and full-time, or those with traditional full-time jobs. The study showed that gig work is not an exclusively urban trend, rather it is equally spread among cities, suburbs and rural areas, thus increasing available income in some areas where there had been few opportunities. Gig workers are also more likely to be in the service and manual labor sector. The most common job categories for gig-only workers are construction, installation and repair, personal care and sales. The most common work for gig-plus workers is computer and information technology, sales and personal care. 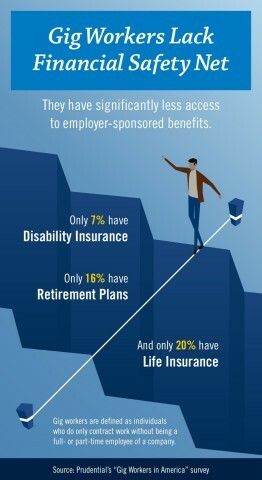 Only 7 percent of gig-only and 21 percent of gig-plus workers have long-term disability insurance. Only 20 percent of gig-only and 37 percent of gig-plus workers have life insurance. Sixteen percent of gig-only and 25 percent of gig-plus workers have assets in an employer-sponsored retirement plan, compared to 52 percent for their full-time counterparts, according to the research. "While working independently has its rewards, the uncertainty of gig income makes it difficult for people to prepare for emergencies or save and invest toward achieving important financial goals," said Sullivan. The Gig Worker On-Demand Economy survey was conducted online by Harris Poll on behalf of Prudential from Jan. 5 to Feb. 18, 2017, among a representative U.S. sample of 1,491 workers. Gig work was defined as providing a service or labor and excluded renting assets (e.g., Airbnb) or sell goods they produce (e.g., Etsy). Read or download Gig Workers in America: Profiles, Mindsets and Financial Wellness . Prudential Financial, Inc. (NYSE: PRU), a financial services leader with more than $1 trillion of assets under management as of June 30, 2017, has operations in the United States, Asia, Europe, and Latin America. Prudential's diverse and talented employees are committed to helping individual and institutional customers grow and protect their wealth through a variety of products and services, including life insurance, annuities, retirement-related services, mutual funds and investment management. In the U.S., Prudential's iconic Rock symbol has stood for strength, stability, expertise and innovation for more than a century. For more information, please visit www.news.prudential.com.